U.S. negotiators acknowledge neither side will be fully satisfied with peace proposal, but stress that is the only way to achieve peace. The U.S. negotiators seeking to restart peace talks between Israel and the Palestinian Authority (PA) on Wednesday said that neither side will be satisfied with the Trump administration’s peace proposal, but added that was the only way to achieve true peace. “No one will be fully pleased with our proposal, but that’s the way it must be if real peace is to be achieved. Peace can only succeed if it is based on reality,” said a joint statement by the U.S ambassador to the UN Nikki Haley, U.S. ambassador to Israel David Friedman, White House senior advisor Jared Kushner and special representative for international negotiations Jason Greenblatt. The statement was posted to Greenblatt’s Twitter account and was also published in Hebrew and Arabic. Last week, a source said that the U.S. National Security Council has published a tender to hire experts for a steering committee to be established for the plan. The committee would allegedly be chaired by Middle East special envoy Jason Greenblatt. 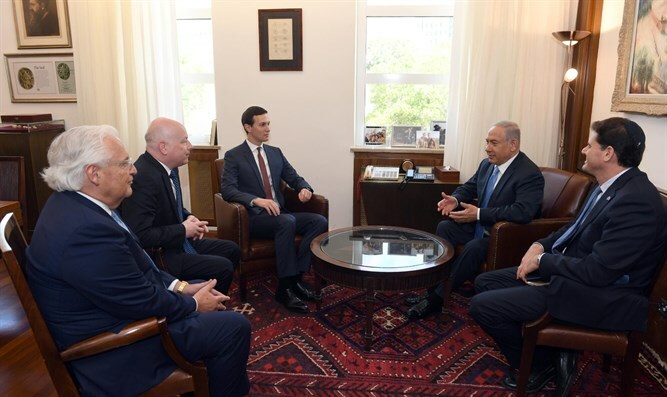 State Department spokeswoman Heather Nauert also rejected reports that the Trump administration’s peace plan has been delayed, saying that when it is ready to be unveiled, it will be unveiled by Kushner and Greenblatt.